I like to pay in food, when I can. While I don’t think Banana Republic is going to start accepting batches of cookies in exchange for a new outfit, I do have some friends who are more than willing to help me out when baked goods are promised in return. My friend Mike actually helped me without asking for anything in return, but when he saved me from a near-mental breakdown (I’m not dramatic. At all!) a few weeks ago over a class project I was working on, I knew a thank you was in order. For the record—I survived the class project, though the technical difficulties I had in the process were enough to make me curse technology a few (hundred) times. 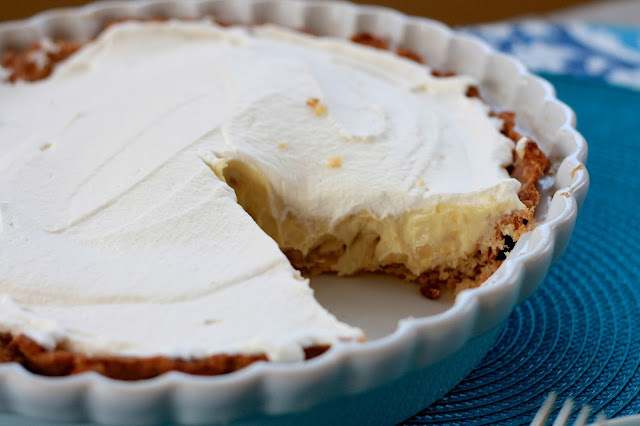 Banana cream pie is one of his all-time favorite desserts (I still remember him swooning over the banana pudding cheesecake I made a few years ago) and one I’ve wanted to make, especially now that I’ve overcome my homemade pudding fears! 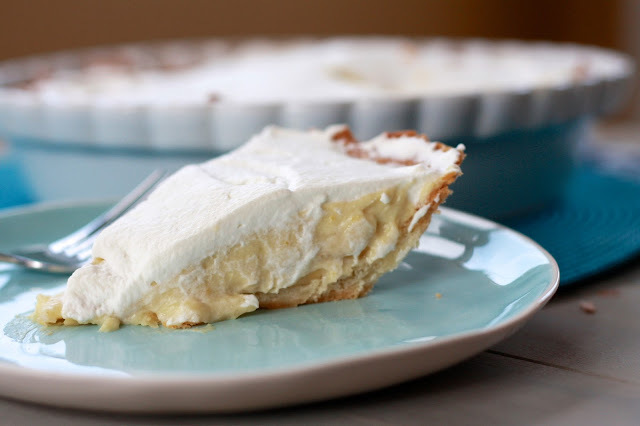 I used a Cook’s Illustrated recipe for the pie, which uses the unique method of infusing half and half with banana flavor rather than relying on banana extract or liqueur like many other recipes do. Although this is the first banana cream pie I’ve ever made, I can confidently say that it’s the only banana cream pie recipe you’ll ever need. It’s a labor of love, but one that is absolutely worth the multi-step process. This was so good that after Ryan and I enjoyed the first piece, I immediately took it to Mike’s before we accidentally ate the whole thing. Ryan didn’t let me forget this fact and asks me about every other day when I’m going to make his banana cream pie. 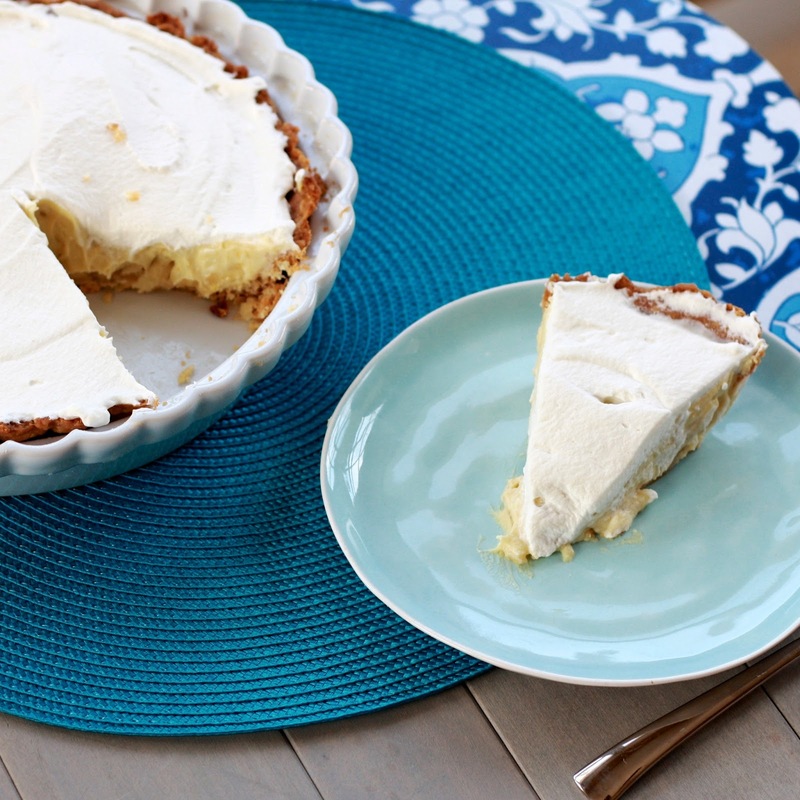 Next time ‘thank you’ won’t suffice, break out this recipe! 1. To make the pie crust, add 1 1/2 cups flour, salt, and sugar to the bowl of a food processor. Pulse until combined. Add butter and shortening and process until dough comes together in uneven clumps (about 15 seconds). Scrape sides of bowl with a spatula, add remaining cup of flour, and pulse until combined (4-6 pulses). Add vodka and water and pulse until dough is tacky and sticks together. Divide dough into two even balls and flatten each into a 4-inch disk. Wrap each in plastic wrap and refrigerate at least 45 minutes or up to 2 days (the second dough can also be scored in a freezer bag and frozen for a later use). 2. When ready to bake the pie crust, preheat oven to 400F and place unwrapped dough on a floured surface. Cover with parchment paper and roll out until thin. Place rolled dough in a greased pie plate and trim edges. Top with a piece of foil sprayed with cooking spray and top with pie weights or dried beans. Bake for 25 minutes. Remove pie weights/beans and foil and bake for an additional 5-10 minutes (watch carefully so it doesn't brown too much!). Transfer pie plate to a wire rack to cool completely. 3. Peel 2 bananas and slice into 1/2 inch thick pieces. Melt 1 tbsp butter in a medium saucepan over medium-high heat. Add bananas and cook until soft, about 2 minutes. Add half and half, bring mixture to a boil, and boil for 30 seconds. Remove from heat, cover, and allow to sit for 40 minutes. 4. In a large bowl, whisk sugar, egg yolks, and salt until smooth. Add cornstarch, whisking to combine. Strain half and half mixture through a fine mesh strainer into the yolk mixture (do not press on bananas). Discard cooked bananas and whisk half and half into yolk mixture until incorporated. 5. Transfer mixture to a clean medium saucepan. Cook over medium heat, whisking constantly, until smooth and thickened (the consistency of pudding). Remove pan from heat and whisk in 1 tsp vanilla and 1 tbsp butter. Transfer pastry cream to a bowl and press saran wrap against the surface. Place in fridge for at least one hour. 6. Thinly slice (1/4-inch pieces) remaining banana and toss with orange juice. Line crust with half of the bananas. Whisk pastry cream briefly and pour half of it over the crust & bananas. Top with remaining half of bananas. Top with remaining pastry cream. 7. Beat heavy cream, confectioners' sugar, and remaining 1/2 tsp of vanilla until stiff peaks form. 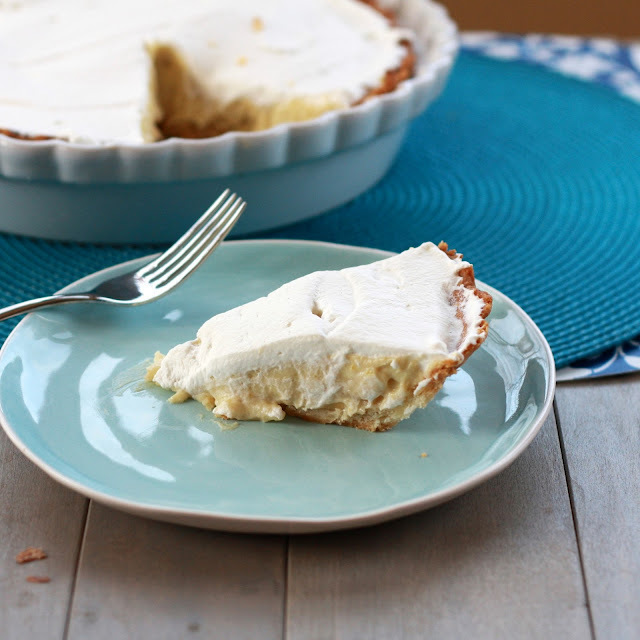 Spread whipped cream evenly over pie and refrigerate for at least 3 hours, until set.